Laundering the spoils from cybercrime can be a dicey affair, fraught with unreliable middlemen and dodgy, high-priced services that take a huge cut of the action. But large-scale cybercrime operations can avoid these snares and become much more profitable when they’re able to disguise their operations as legitimate businesses operating in the United States, and increasingly they are doing just that. The typical process of “cashing out” stolen credit card accounts. 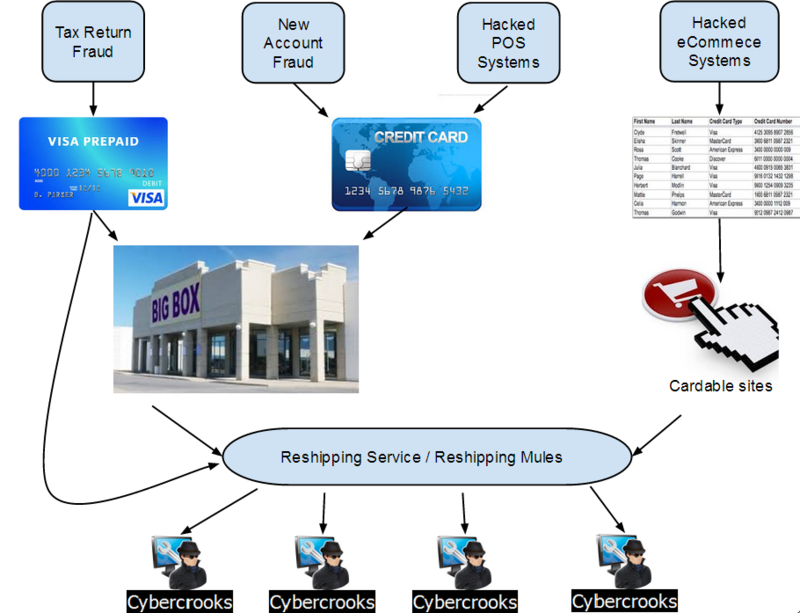 Today’s post looks at one such evolution in a type of service marketed to cybercrooks that has traditionally been perhaps the most common way that thieves overseas “cash out” cybercrimes committed against American and European businesses, banks and consumers: The reshipping of goods purchased through stolen credit cards. 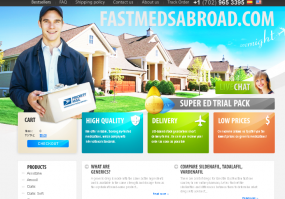 Cybercrooks very often rely on international reshipping services to help move electronics and other goods that are bought with stolen credit cards, shipped abroad, and then sold for cash. Many fraudsters use stolen credit cards to pay for U.S. Postal Service and FedEx shipping labels — a.k.a. “black labels” — but major shipping providers appear to be getting better at blocking or intercepting packages sent with stolen credit cards (at least according to anecdotal evidence from the cybercrime forums). Would that all cybercriminal operations presented such a tidy spreadsheet of the victim and perpetrator data as comprehensively as profsoyuz.biz, one of the longest-running criminal reshipping programs on the Internet. Launched in 2006 under a slightly different domain name, profsoyuz.biz is marketed on invite-only forums to help credit card thieves “cash out” compromised credit and debit card accounts by purchasing and selling merchandise online. Most Western businesses will not ship to Russia and Eastern Europe due to high fraud rates in those areas. Underground businesses like Profsoyuz hire Americans to receive stolen merchandise and reship it to those embargoed regions. Then they charge vetted customers for access to those reshipping services. Below is a screen shot of the administrative interface for Profsoyuz, which shows why its niche business is often called “Drops for Stuff” on the underground. 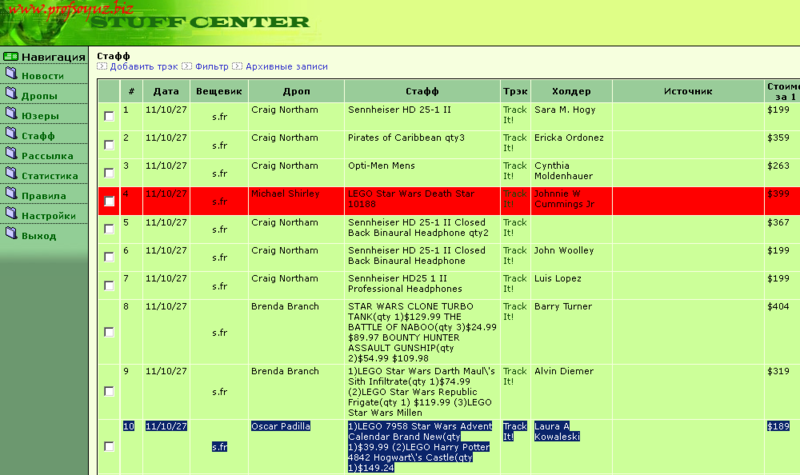 The “Дроп” or “Drop” column lists Americans who are currently reshipping packages for the crime gang; the “Стафф” or “Stuff” column shows the items that are being purchased and reshipped with stolen credit card numbers. 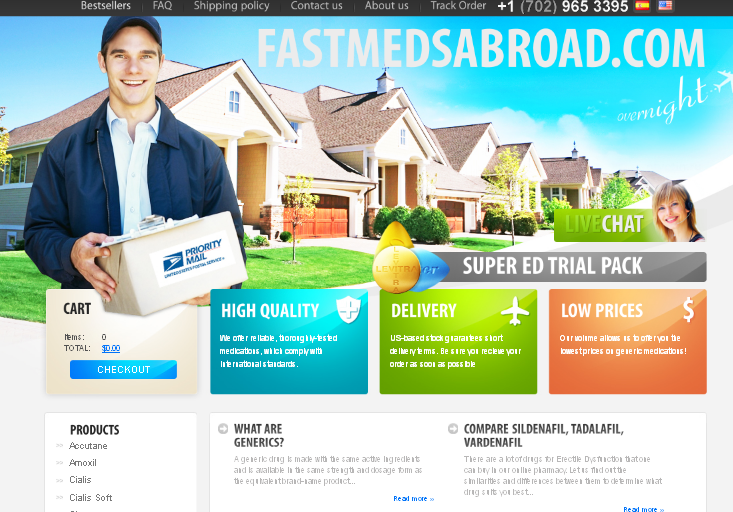 Profsoyuz reshipping service admin panel. The column marked “Холдер” or “Holder” indicates the cardholder — the name on the stolen credit card account that was used to purchase the stuff being sent to the drops. I rang Laura Kowaleski, listed as the person whose credit card was fraudulently used on Oct. 11, 2011 to buy a Star Wars Lego set for $189, plus $56 in shipping. She told me I reached her while she was in the process of filing a police report online, after reporting the unauthorized charge to her credit card company. The Lego set was sent via FedEx to Oscar Padilla, a 37-year-old from Los Angeles. Padilla said he believed he was working for Transit Air Cargo Inc. (transitair.com), a legitimate shipping company in Santa Ana, Calif., and that he got hired in his current position after responding to a job offer on careerbuilder.com. However, the Web site used by the company that recruited him was transitac.com.